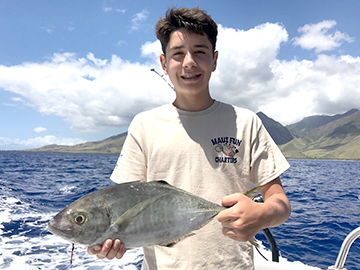 Max Dennis comes to Hawaii every year from New York to fish! This year he wanted to cruise out to the deep and see what he could bring up. After getting a couple dinner fish he hooked up to what at first we thought was a dobe but quickly realized was a whitefinned jack before his trip was done he had 5 total the biggest one being 4 lbs. after weighing it we all got to eat some. Bugga was Ono.